Situated on the banks of the river Sabarmati, Ahmedabad is a city with malls and multiplexes on one side and museums and monuments of historical significance on the other side of the river. An interesting mix of the old and new, a rich reservoir of historic architectural marvels, Ahmedabad is the largest city of Gujarat. Ahmedabad’s pol culture is world renowned and many foreign tourists visit Ahmedabad each year just to have the look and feel of the heritage of this beautiful city. Ahmedabad’s Bus Rapid Transit System (BRTS) is the most successful initiative of its kind in India. Ahmedabad is now flooded with malls, multiplexes, premiere institutes and all forms of development. Sabarmati Ashram : Set up in the year 1915, Sabarmati Ashram was the central point from where the struggle for India’s Independence was started. Till the year 1930, the Ashram at Sabarmati was the home of Mahatma Gandhi. The museum exhibits the life of Mahatma Gandhi. It is open from 8.30 am to 6.00 pm every day. Sabarmati Riverfront : An innovative project, the Sabarmati Riverfront undertaken by the Ahmedabad Municipal Corporation consists of a magnificent walkway over the river Sabarmati. Gardens, esplanades, amusement parks, golf courses, water sports Park and slum rehabilitation are part of this project. The entire riverfront offers a panoramic view of the city’s landscape. Kankaria Lake : Constructed in 1451 by Sultan Qutb-ud-Din, the Kankaria Lake has been designed to be one of the amusement areas of Ahmedabad. Featuring a zoo, a natural history museum, Bal Vatika (children’s garden) along with eating joints, the lake is a major attraction spending an evening. 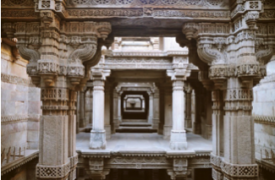 Adalaj Vav : The Adalaj Ni Vav is situated 18 km. north of Ahmedabad and is a popular tourist place. This place is a must for any visitor who enjoys exploring the history and appreciates great architecture. Jama Masjid : One of the most resplendent mosques of India located in the city. Built with yellow sandstones, the architecture of this mosque is a blend of Hindu and Muslim styling. Sidi Saiyad Mosque : Built by Sidi Saiyed in 1573, this elegant mosque is famous all over the country for its fantastic architecture and exquisite Jali work or stone tracery. A vivid example of Indo-Saracenic architecture, the stone has been carefully carved in order to create the filigree effect. Calico Museum : The premier textile museum of the country , known for its distinguished and comprehensive collection of textiles and artifacts its outstanding collection of Indian fabrics exemplifies handicraft, textiles spanning five centuries and attracts large numbers of visitors from the general public, as well as increasing numbers of Indian and international research scholars. Timings: 10.00 am to 12.30 am; 2.30 pm to 4.30 pm. Science City : Science City is an initiative of the Government of Gujarat to trigger an enquiry into science with the aid of entertainment and experiment. The 3D IMAX Theatre, Musical Fountain, Energy Park and Simulation Rides are the focal points of this complex. The Park is open from 12.00 noon to 8.00 pm. Sarkhej Roza : One of the most resplendent mosques of India located in the city. Built with yellow sandstones, the architecture of this mosque is a blend of Hindu and Muslim styling.